Things were not looking promising the night before. The big girl had been down with a bad cough for a few days and the little one still had not fallen asleep when the clock struck midnight. All the commotion made me so awake and after everyone slept, I just couldn't fall asleep and decided to watch Vampire Diaries instead. Were we going to make it? Call it experience or confidence, one way or the other, I was still pretty sure we would. The next morning, which was the day of the Cold Storage Kids Run 2015, the hubby and I woke up promptly at 7am. The good news was that our first race was to be flagged off at 8:15am so we only had to be there by 8am and the kids could sleep in a little longer. The bad news was that this meant by the time we reached, there was absolutely nowhere to park our car. Anyway, the three of us alighted first and we were thankful to see that the weather was good. Both the kids were jumping with excitement and they had their light breakfast - a few mouths of bread, banana and Milo - along the journey. So when we arrived at the entrance of The Meadow at Gardens by the Bay, we were all ready to start the day! The place was bustling with people and it was not difficult to spot the tentage where participants were supposed to queue up for the races. Announcements were clearly and repeatedly made to inform people of which race was going to be next. Each race was also colour coded so you could only enter if you were wearing the corresponding coloured race bib. Yippee! It was going to be the toddler's first run! After having been a cheerleader at the sideline for the past two years, I was really thrilled for her that she could finally be in her own run. Of course, I wanted to be the one right beside her on this special occasion too and was glad that we were going to be in the Jolly Kiwi Family Fun Run (for 2-4 years old) as mother and daughter. Now, we were all set! Isn't this a beautiful day with beautiful skies and a beautiful backdrop? Wait, something was missing. Or rather, someone. Yes, Daddy! We started getting anxious when there was still no sign of him and it wasn't long before Ariel's race was going to begin. Even though he was going to run with Angel in the Merry Berries Family Fun Run (for 5-6 years old) and which would only take place 15 minutes later, I would need him to be around to look after the big girl while the toddler and I went to take our place at the starting line. Oh dear, where were you? Thankfully, within a couple of minutes, he arrived at the scene, panting even before the race started. Apparently he couldn't find a parking lot and so had to park all the way at Marina South Pier, therefore having to sprint over 1km just to get back to us. Awww, thank you Daddy. So, we were all set for the horn to sound! I have to tell you that I'm always amazed by the sheer number of parents and children who take part in these races. Yes, it's definitely good to know that we are not the only family who loves running! On your mark, get set, GO! Our run started! It was awesome seeing so many other toddlers in the run with us but I soon realised many of them were being carried by the parents and started to worry if the toddler would want the same. Indeed, she initially seemed a little overwhelmed by everything that was happening, kept getting distracted and finally decided to raise her both arms, ran to me and said "I want Mummy carry." I tried to refuse and that didn't work as she started to cry. I decided that it wasn't worth getting her upset just because Mummy wanted her to run, so I carried her up in my arms and explained to her about what was going on. Then, I told her she could have a huge candy when she reached the finishing line. Lastly, I also said that Daddy and Jiejie were waiting and cheering for us and we needed to get back to them as fast as we could. I'm not sure which one worked the best but she seemed to understand my point and promptly got down after just half a minute, showing me that she was willing to try on her own. Awww. So we walked, strolled and ran hand in hand for the entire 800m after that and nope, she didn't ask to be carried again. That's my girl! In fact, she started to enjoy the run and even waved to all the friendly passers-by. And when we reached the finishing line, she gave me this sheepish smile which looked really cute and I just wanted to tell her how proud of her I was. Kudos for making it through, darling Ariel, you did a really fabulous job for your first run! See? She was so elated to receive her first medal for running in a race and even a certificate to say that she was a Junior Champ. Woohoo! Now, on the other side, something exciting was happening too! 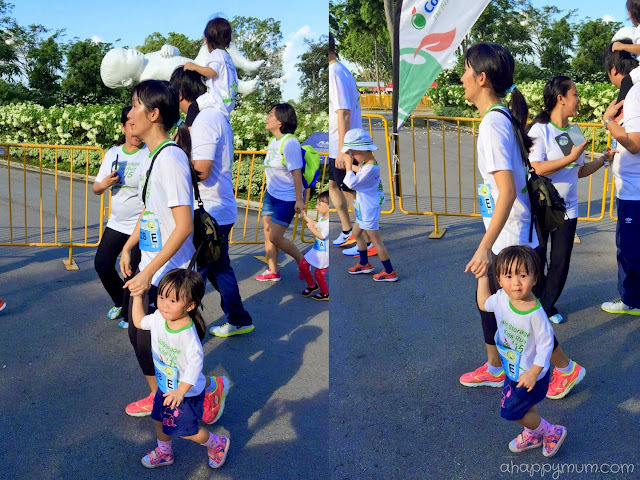 The big girl was going for her 3rd Cold Storage Kids Run! I was concerned about her as I knew the cough made her feel uncomfortable and I wouldn't be surprised if she wanted to take a rest halfway through the run. However, I was glad that the hubby was going to be with her and I knew that he would do his very best to guide, lead and encourage her to give it her best shot. I also knew in my heart that this girl had more determination than I imagined so I was sure that things were going to work out just fine. Ariel and I were not able to catch them at the starting line so we dashed to the finishing line hoping to catch a glimpse of them. Luckily for us, within a minute, they came in and I was pleasantly surprised when the hubby said that Angel didn't stop at all but ran the whole 800m! You go, girl! She did look tired and was panting when I took this picture, wanting Daddy to carry her up for her triumphant moment. Nonetheless, I hope she knew that we were proud of her for not giving up despite not feeling well and that she will remember perseverance is a key quality that will carry her through her life. Sisters reunite! These two were happy to be together again and of course, they showed each other their newly earned medals! Now, if you can't see from the pictures, it was truly a scorching hot day and everyone was perspiring profusely under the sun. What would be best thing to happen after the run? Imagine some cold orange juice, fresh fruits and even a breakfast buffet including pancakes, hashbrowns, sausages and eggs? Heavenly. 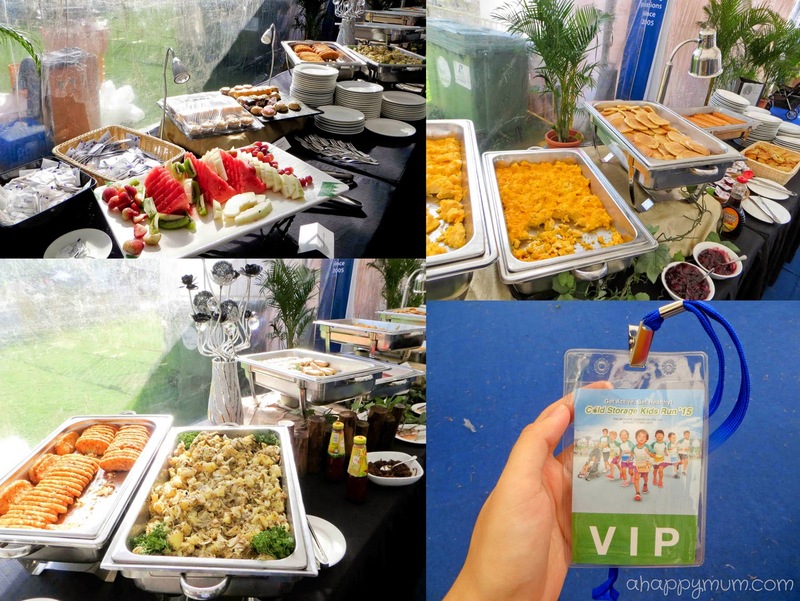 Thanks to the event organiser ESG, we were invited as VIPs this year and had a wonderful reception waiting for us and our tummies. Well, before we ate, we got to work first! 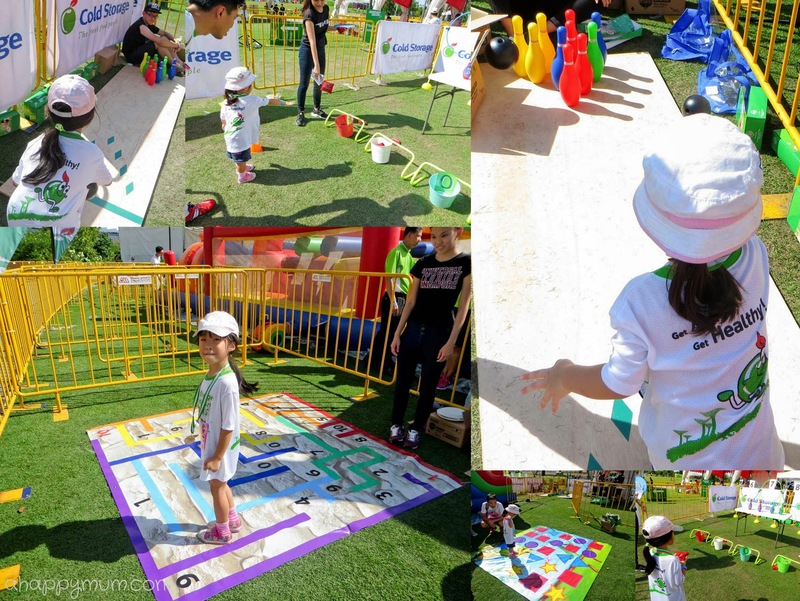 We did a short interview with Yasminne from Class 95FM and talked about how this was our 3rd consecutive Cold Storage Kids Run and how we trained the kids up for the big day. Angel was also a little surprised when she was posed a question and had to answer how she felt after the race. She only managed to utter one word - "Happy", which I thought couldn't be more apt. At that moment, I realised the purpose of us taking part in all these runs, hustling with crowds and sweating under the hot sun was for one sole purpose - to make the kids happy. And I was sure glad we succeeded. Anyway, we sat down to tuck in and relax for a good half an hour while watching the prize presentation and activities going on the stage which was right next to us. Ariel was delighted when there was a dance segment and rushed forward to join in with all the other kids. Well, that showed she wasn't so tired after all and had more energy to spare! Another good thing about being VIPs was that the kids got to come up close with the mascots the moment they emerged and take pictures with them in the shade! Now, despite the blazing heat, if we were to think positively, it would have been a hundred times better than a rainy day, right? 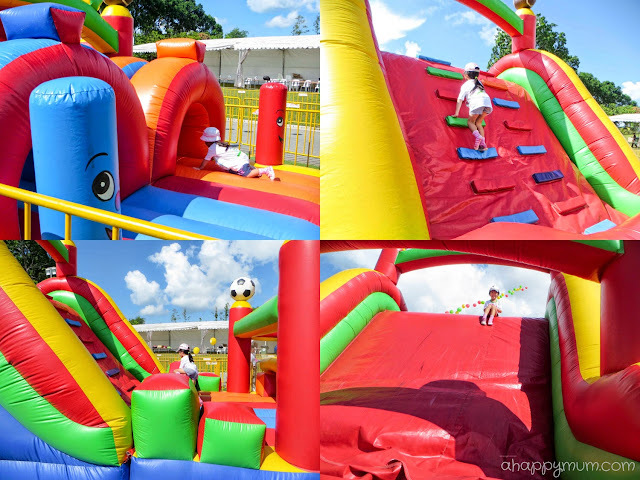 With that in mind, we set out to explore all the games and kids activities that were going on under the bright, glaring sun. One good news was that the heat probably deterred many people from coming and we didn't have to queue at the stations for the kids to play the games! Yayyy! They tossed beanbags, did bowling and played puzzle games which delighted them. Obviously, these two were not bothered much by the heat. Next, Angel also went through an obstacle course which the hubby commented to me "Let's skip this. It's super hot inside there!" Well, I guess I had a girl as crazy as me because she seemed to enjoy every bit of it and didn't complain in the least, not even when her bum burned from going down the long slide. 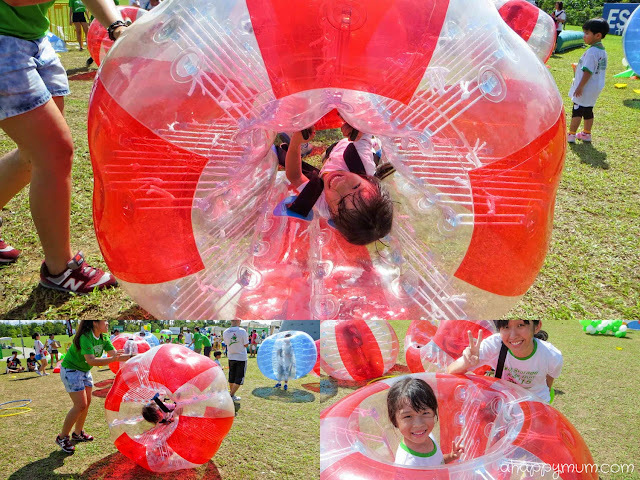 The big girl also took the leap and for the first time agreed to try the inflatable giant ball game! Now, the kids were supposed to collide with each other and then fall over but this girl was too gentle and didn't know how to bump into others. So there was this friendly lady who asked if she preferred to be rolled over, which she obviously did and so started rolling around for a good minute. 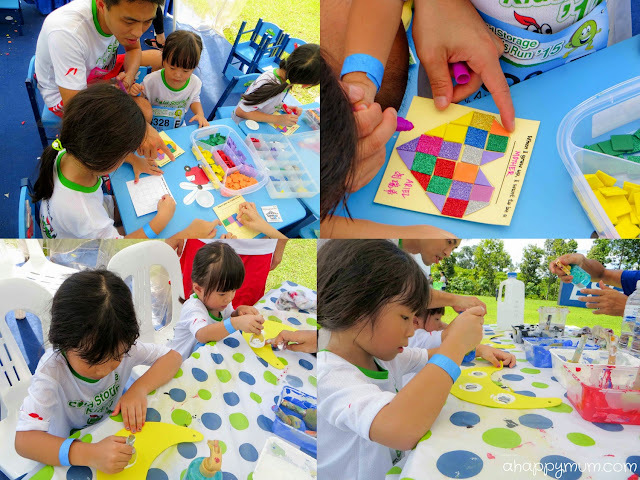 Last but not least, the girls also had fun at the art and craft stations where they made heart shaped collages and painted their own visors. They had to complete the sentence "When I grow up, I want to be a _______" and both of the girls said "Mother". I swear I didn't prompt them. Well, the hot sun didn't melt my heart but this probably did. Anyway, I was truly glad to see their smiles and relieved that we stayed back an hour to let them indulge in all these fun activities. Soon, it was time to bid farewell! It was funny that we had to take the MRT and even switched lines so that we could get back to our car, but we wouldn't have traded the day's experiences for anything. Thank you Cold Storage Kids Run 2015 and ESG for all the fun and happy memories, we sure hope to be back again next year! Now they say that second time makes you wiser, I think we gained quite a bit of experience from taking part in so many family runs. So, here are some tips we have to share if you are considering joining one soon too! Participants will not be allowed to join the run if they are not wearing these race bibs, so never, ever forget to bring them. Pack them into the bag the night before, check that everyone's bib is intact and put on the bibs early on the day itself to avoid fumbling at the last minute. If both parents are going to be running with the kids and you have no one help to look after your belongings, choose a bag that you are most comfortable to run with. The hubby takes a small backpack while I use a shoulder sling pouch. Make sure you have your mobile phones with you so that you can reach your spouse in the case that you fail to meet at the finishing line. While you should not have a heavy breakfast, it's also not advisable to run on an empty stomach. This is especially so for kids who will need energy to make it through the run. If you can, prepare some snacks or food the night before or wake up earlier on the day itself to do so. If you can't, buy some bread, biscuits, fruits or finger food beforehand and even if the kids only take a few bites, it's better than not eating at all. Regardless of whether it's a hot or rainy day, chances are your child will have a wet shirt halfway through the run so a change of clothes will be handy. I also let them put on sunscreen before the run and ask them to wear their caps when it gets really sunny. Well, the good thing is we dump some of these into the car so we do not have to carry all of them. If you are not driving, then try to bring along lightweight clothes, a small bottle of sunscreen and let them wear their caps. As mentioned, if your run is not scheduled as one of the earlier runs, then you will likely find that you cannot find a parking lot when you arrive. Yes, it's usually the case of the later you arrive, the further away you will have to park. So, it does help to plan ahead and try your best to arrive earlier so you can secure a parking lot. If you are not driving and decide to come by public transport, make sure you know your route well and leave ample time for travelling or last minute delays as you really do not wish to be late and miss the run. This might seem as logical and straightforward, but when you have kids to look after especially those who prefer to pick out their own outfits, it's better if you decide and agree on the attire beforehand. This will include footwear, socks and bottoms since you will be dressed in the event t-shirts which were collected with the goodie bags. (The collection takes place 1-2 weeks before the event, check that you have the right sized shirts and right race bibs.) Ensure that the kids are comfortable to run in their shoes as these can either make or break the will to run. I've realised that in all these races, mineral water bottles and even isotonic ones are given out generously to all the participants so there is no worry of dehydration. In case you are wondering, yes, there are plenty of portable toilets too. Unless there is a special beverage that your child really needs, if not, there is no need to carry a huge water bottle and increase your load. I find that it's better to prepare your child in advance by giving him/her an idea of what's going to happen, especially if this is the first time, to prevent him/her from feeling shocked or overwhelmed during the run. Don't expect your child to emerge as the top three but give lots of encouragement and assurance along the way. At the end of it all, tell him/her just how proud you are and congratulate on a job well done. Of course, you can always say that we still have room for improvement so that everyone will look forward to the next run! Lastly, as best as you can, create happy memories from the day which will last your family for a long, long time. Enjoy the moment and don't let the hot sun take away any of your joy! 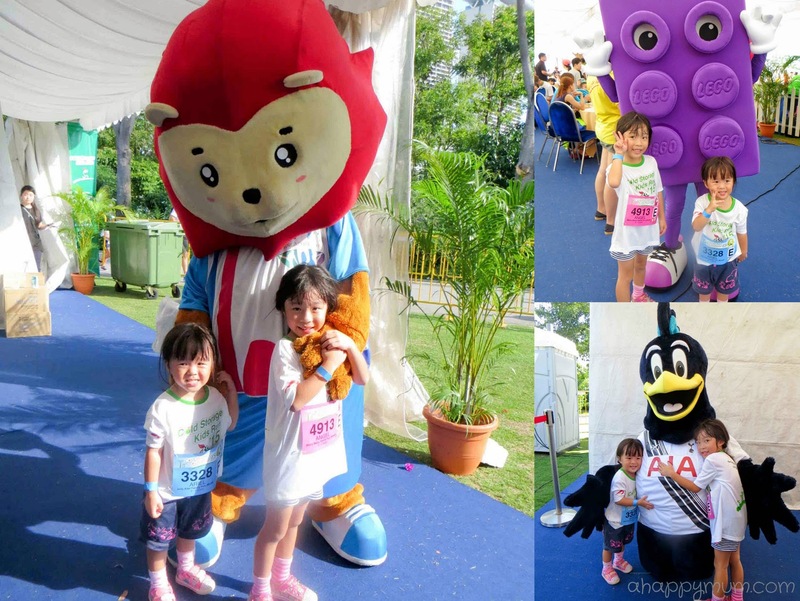 Disclosure: We were invited to join the Cold Storage Kids Run 2015 and the kids received complimentary entries. All opinions are our own.